Citizens from the land of Down Under have finally struck gold with this impressively licensed and certified online casino catering exclusively to every Aussie’s needs – Say hello to Joe Fortune! A newbie to the world of online casinos, but by no means a fly-by-night scammer, this gaming platform offers you everything you may need to experience the thrill of gambling without the hassle of leaving the comfort of your home. Would you like to get to know Joe a little better? Well, settle in... here we go! Joe Fortune offers the standard methods of depositing and withdrawing funds through the use of Visa, MasterCard, Bank Wire or Check, but have also introduced the revolutionary cryptocurrency Bitcoin alternative to their list of banking methods. Because of the fact that some banks have policies in place regarding using your credit card on gambling sites, it makes so much more sense to use the Bitcoin option when depositing funds or withdrawing your winnings. The advantages of using Bitcoin surpass standard methods in that transactions are processed very quickly, the payments are virtually anonymous, and you, therefore, avoid online sharing of bank account and credit card information. Withdrawal times on standard methods range between 3-7 business days, and Bitcoin payouts can occur within 24 hours. Joe Fortune offers a huge, fat welcome to all new members on their online casino by providing them with an impressive welcome bonus that has the potential of earning you an extra $5,000 of playable funds. Your first registration deposit will be matched 200% up to $1,000, and your next 8 deposits thereafter will be matched 100% up to a maximum of $500. There is a 40x playthrough requirement on the bonus and initial deposit amount before any of the two and winnings can be withdrawn. As with most online casinos, the fastest way to fulfill that requirement is playing slots and specialty games as they have 100% wagering contribution, whereas table games and video poker only contribute 20% and 10%. Returning customers are not left unrewarded and will be thanked for their commitment by automatically being included in Joe’s Ripper Reward Program. On this loyalty scheme, you earn 1 point for every $1 wagered on Slots and 1 point for every $4 bet on all the other games in the casino, and you also have the potential of earning a 10% daily cash-back on your deposits. 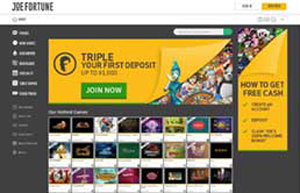 The VIP Ripper Reward offers 15% cash-backs on deposits, birthday bonuses, as well as faster and free withdrawals. Client and transaction security is of utmost importance to Joe Fortune, and to this end, they employ the strictest standards of online security with 128-bit encryption technology. They also guarantee that all sensitive player information stored on their internal website will be encoded and only accessible to relevant personnel. Joe Fortune Online Casino is licensed through Curaçao eGaming, who in turn are regulated by the Government of Curaçao, with Joe further adhering to all iGaming industry standards regarding a fair and responsible gambling establishment. Joe Fortune’s website itself is plainly designed with an uncluttered landing page which is neatly categorized in pertinent tabs for easy one-click access, and you won’t be left feeling frustrated at having to wade through multiple pages to view any relevant information. All games in Joe’s arcade can be played through the instant play platform, meaning you do not have to download any software to your computer and can instead access the site directly through your browser. Joe also offers clients the option of play on their convenient mobile casino which requires no download once again, and is compatible with virtually any device – Android, iPhone, iPad and Windows Smartphones. Joe Fortune has gone all-out in an attempt to offer its clients a wide range of extraordinarily designed games, and have brought the leaders in the field on board to deliver on this promise, namely Microgaming, Rival and Real Time Gaming. Aussies love Pokies, and at Joe’s they’re in for a wild ride with an extensive selection of their most loved casino game. There seems to be a slot machine for every imaginable taste out there, and the casino delivers the most graphically stimulating titles currently available, including Game of Thrones, Shopping Spree, Scary Rich, Tomb Raider, and Jurassic Park which are proving to be firm favorites. For the table game fans out there, Joe once again provides what his customers require, by offering a wide selection of Video Poker, Table, and Specialty Games. The Table Game arcade offers a selection of more than 15 familiar names in the blackjack, roulette and craps department, which includes Blackjack (several varieties), European and American Roulette, Baccarat, Craps, Caribbean Stud Poker, Let’em Ride, and Tri Card Poker. The Video Poker category boasts with both classic and newer names to the market, and popular titles like Jacks or Better and Joker Poker come in single and multi-hand modes. Other titles include Deuces Wild, Bonus Deuces Wild, Loose Deuces, Bonus Poker and Double Bonus. The specialty games selection includes “scratchies” which are your basic instant win scratch cards and a range of bingo-type games for a quick attempt at huge prizes. Joe Fortune has friendly and professional staff available to attend to any questions or assistance you might need. They are available from 8 am to midnight either via telephone on 1800-837-129 or on their Live Chat portal. You can also reach out by filling in the online contact form and mailing it off to [email protected] You might also find the answers to any general questions you might have under the extensive FAQ section on the website. The website, as well as support service, is available in English and Mandarin. As a newcomer to the world of online casinos, one would expect a less than perfect gaming platform, but we are pleasantly surprised at the seemingly picture-perfect playground for Australian players. Joe Fortune entered the competitive race only last year and have already surpassed many of the longer running participants in this dog-eat-dog world, and have in fact taken the lead in many aspects. Our Aussie players can now finally also get in on a little of the action on a site that is designed with you exclusively in mind. There is something of everything to appeal to your tastes, and you most definitely won’t find a better selection of pokies to choose from, you will be handsomely welcomed and rewarded for loyalty and every friend referral you send Joe’s way, and you also have the assurance of a completely safe and secure portal on which to experiment at every gaming table available in the arcade. One of the most outstanding features of Joe Fortune is the fact that they have incorporated Bitcoin onto the platform as a deposit and withdrawal method, allowing for super-fast withdrawals. With all these features rolled into one impressive online casino, you won’t have much to complain about, and we are more than happy to rank Joe among our top contenders on the list of recommended casinos for Aussies. Here’s to Joe Fortune – well-done mate, you are a winner in our eyes! How can I get in contact with the support center? You can get in contact with the friendly and professional support staff by calling them on 1800-837-129, sending off an email to [email protected], or alternatively, try out their convenient Live Chat option. For more general enquiries feel free to take a look at their comprehensive FAQ section on the website. For sure! They are licensed and certified through Curaçao eGaming and adhere to the stringent iGaming industry criteria regarding fair play and responsible gambling – all of this ensuring Joe Fortune’s legitimacy as a legal gambling establishment. Is Joe Fortune secure or safe to play on? Security is paramount to Joe Fortune and they make us of 128-bit SSL encryption technology to ensure that your personal information and transaction details are protected at all times.